The flag of Louisiana was officially adopted in 1912. The flag is a blue field contaning a "pelican in piety" (the design is also found on the state seal and is emblematic of Christian charity), which shows a mother pelican wounding her breast to feed her young with her blood. 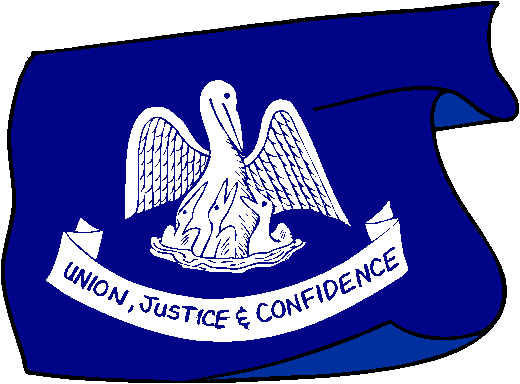 It is traditional to depict three drops of blood on the pelican's breast, however in 2006 it came to the State Legislature's attention that the drops of blood had often been omitted in recent years, so a bill was passed requiring the drops of blood to be depicted on the state flag and seal.